When it comes to toothbrushes they there tends to be 2 classifications. There is the manual toothbrush, where it relies on good old fashioned human power to move the bristles and then there are the electric toothbrushes, those that rely on a power source and motor of some kind to do the work. A manual toothbrush is perfectly adequate, but there are many benefits to an electric toothbrush. The vast majority of electric toothbrushes are powered by built in, non-removable batteries. Generally speaking these are the gold standard and would be my suggested choice if suitable for yourself, but there are those that use removable AA and AAA batteries that can be a more appealing option for some. An extensive list of pros and cons for battery powered brushes is provided later in this article, but their most appealing feature has to be that they are more effective than a manual brush in removing plaque and debris, whilst being cheaper than a full blown rechargeable electric toothbrush. Convenience is key for many too, as they don’t rely on having a toothbrush charger. Having tested many different brushes, if you are looking specifically for a battery powered toothbrush, then continue reading to find out which are the best options to go for. Should you be willing to consider an electric toothbrush with a battery built in, check out our roundup of the best electric toothbrushes. Whilst it is very difficult to put my suggestions into a strict order of best to worst, the following are in a fairly accurate order of what I consider to be the best battery toothbrushes available today. I have also included short reviews of my hands-on time with each brush, highlighting the pros and cons of each one. Quite simply superb, this battery operated toothbrush puts a lot of the other options to shame. Made by Chinese brand Fairywill, they may be a budget brand with little reputation against the ‘big boys’, but that is changing with the sheer value for money they offer. At the time of review, I paid less than $15 for this 2 x AAA battery powered toothbrush, that comes complete with 2 brush heads in the box. Slim and very lightweight, it is a little plasticy, but that is perhaps to be expected. If I was being really picky a little extra grip on the handle would be nice, but I really am splitting hairs here. There are 3 cleaning modes; clean, sensitive and massage and the brush offers up to 35,000 movements per minute. It really works and I genuinely felt that I was using a regular electric toothbrush, it was that good. There is a 2 minute timer, 30 second pacer and automatic power off technology built into the brush. The brush heads and battery compartment cover lock on nice and tight, with small icons to make it clear how to open, close and lock into place. There is even a small moulding on the back of the brush that stops the brush from rolling around if laid flat. The batteries will last about 3 months with daily use. There is no travel case, but plastic caps to go over the brush head bristles are provided. Replacement heads are easy to find and are equivalently priced or cheaper than the big name brands. Design – Looks pretty good. Slim and comfortable to hold. Cleaning experience – Felt like I was using a proper electric toothbrush. Multiple cleaning modes – 3 cleaning modes available. Timer & pacer – 2 minute timer and 30 second pacer built in. Automatic power off – Brush turns off automatically after 2 minutes. Replacement brush heads – Just replace the head, not the handle. Box contents – 2 brush heads included in the box. No travel case – No complete case but you do get a small cap that goes over the brush head. Exceeding my expectations the TempIR does lack desirable elements like a 2 minute timer and pacer but it makes up for it with the value for money and cleaning performance. It offers 30,000 movements per minute through the brush head and you can feel this. I would go as far as saying it almost felt as good as a true electric toothbrush. A bit of a negative is that a lot of vibration that passes through the brush handle, if feels a bit of a waste. 2 simple buttons on the handle turn it on and off, so it is nice and simple to use. A single AAA battery powers the brush and this is user replaceable via the screw cap at the base of the brush. It does have a slightly larger brush head than some other brushes, but it’s not the biggest head either. Slim and comfortable to hold in hand, there is plenty of grip on the handle and this grip also stops it rolling about on a countertop when laid flat. There is no travel case, or even caps for the brush head which is a bit of a shame. The box contents is superb. 2 brush handles, 1 x Pink and 1 x Blue and then 3 brush heads for each handle, and yes, the heads are easily replaceable too. Design – Slim, light and easy to grip hold of. Powerful – Felt more powerful than many other brushes. Box contents – 2 brush handles and 6 brush included in the box. No timer or pacer – No way of knowing how long you have been brushing for. No travel case – No protective case or cap to use when on the go. Vibration – A lot of vibration felt/lost in the brush handle. Larger brush head – Reasonable sized brush. For design and service simplicity, Quip wins hands down. It is available to buy here on the Quip Website. 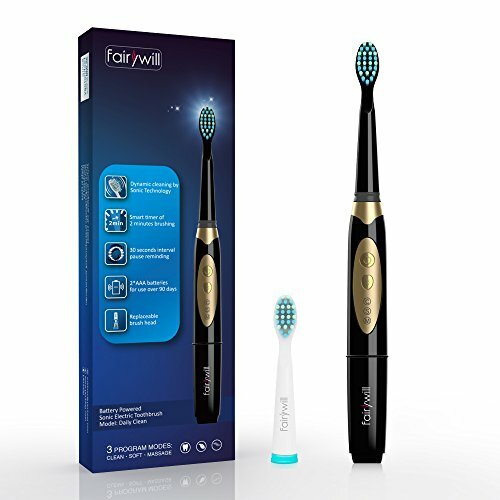 It is a very slim, stylish toothbrush with a very clever travel case come holder that sticks to surfaces like mirrors and tiled walls to hold the brush upright and off of worktop surfaces. You can make a one off purchase, but the key selling point is their subscription service which delivers a replacement brush head and battery to your door at 3 month intervals. The set it and forget it mentality of the subscription plan is great as is the fact you need only replace the head, not the handle too. Available in plastic or metal handle configurations, they have color choices to suit your style. Powered by a single AAA battery, the brush delivers up to 15,000 movements per minute. Getting a little picky I do find positioning my finger to turn the brush on a little awkward, but it’s not a big issue. Personally I felt the cleaning power to be very weak and I was not all that sold on it, but that said, it could be doing more good than I know or can actually see. A 2 minute timer and 30 second pacer is built in to help you brush for the right amount of time too and to make life just that bit easier, it turns itself off. Design – Looks and feels really good. Slim and comfortable to hold. Travel cover mount – The cover that protects the brush head doubles up as a mount that sticks to surfaces such as a mirror or tiled wall to hold it securely. Subscription – Replacement heads and battery delivered to your door. Cleaning experience – Odd feeling, really doesn’t feel like it is working. Design – Power button can be a bit awkward to move the finger to. Read our hands on review of Quip. Sonicare are well known for their electric toothbrush range, but this is the only model to be powered by user removable batteries. 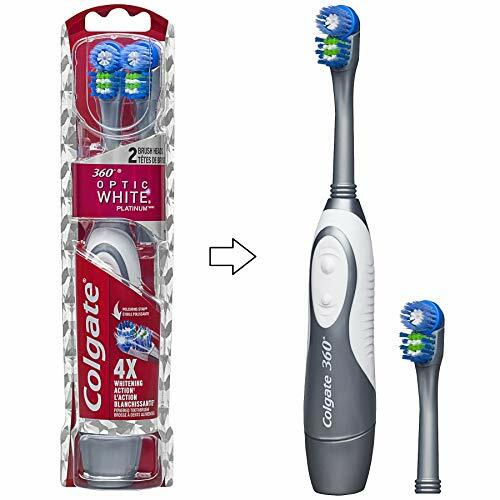 Using 2 x AA batteries the bristles move at 15,000 times per minute, half the speed of most other Sonicare brushes, but a significant speed improvement over any other manual toothbrush. It certainly feels like it is doing a pretty good job when in use, but I do prefer the more premium models, if I am honest. The chunky brush handle is easy to grip thanks to the colored rubber pieces. It is not as slim as many other brushes, but this could be just what you are looking for. A simple press of the power button turns the brush on and it will run for 2 minutes until it will automatically turn off, signalling the end of the clean. There is no 30 second pacer like more premium models. The brush heads are replaceable like the batteries and both need replacing at approximately 3 month intervals. Design – Chunky and easy to keep hold of. Timer – 2 minute timer built in. 15,000 movements – Feels like the brush is doing a reasonable job of cleaning the teeth. No pacer – There is no 30 second pacer to help give an even clean. Read our hands on review of the Philips Sonicare PowerUp. Made by one of the best known toothbrush brands, the Pro-Health Clinical cleans relatively well. You can view it on Amazon here. The small round brush head is nice and easy to move around even the most crowded of mouths and it certainly feels like it is working. You can hear it working too, because this is one of the louder battery operated brushes available today. Powered by 2 x AA batteries it is a chunky brush that will take a few knocks and is certainly larger than even an electric toothbrush. The nice amount of grip on the handle is a real bonus. Sadly there is no timer, pacer or travel cap or case included. In its favour is the really long battery life, counted in months rather than weeks. When you do need to replace the battery, removing and replacing the cover can be a bit of a fiddle, but with few instances of this, I can let this slide a little. Design – Chunky brush with plenty of grip to hold onto. Battery life – Really long battery life. Months rather than weeks. Cleaning experience – Feels like it is working and doing a pretty good job of cleaning the teeth. Design – One of the larger battery brushes I have used. Battery cover – Can be a bid fiddly to remove and replace. Noise – Quite a loud brush in operation. Read our hands on review of Oral-B Pro-Health Clinical. Many are familiar with Colgate, they ahve been around the years and most of us trust them to produce a good toothbrush too. Far from the worst brush on the market, I do believe you can get better than this, albeit it is functional. This battery toothbrush uses 2 x AAA batteries and gives a good few months of brushing time from it, rather than just a few weeks, which is great. A big chunky and grippy handle, this could be good for those that struggle to grip onto smaller things. The brush head is pretty large though and can make effective cleaning and moving around on the smallest of mouths a bit more tricky. There are 2 parts to the brush head, a round section of bristles that move when the brush is powered on and then a section of bristles that only work as you manually use the brush. 2 buttons are found on the handle, 1 to turn it on and the other to turn it off. The brush heads are replaceable as are the batteries, so bonus points here. You do to get an extra brush head included in the packaging, which is not all that common today. A bit of noise comes from this brush when in use and sadly there is no timer or pacer built in. There is too no travel case or cap for the brush head. Box contents – 2 brush heads included. Large brush head – Larger than average sized brush head. 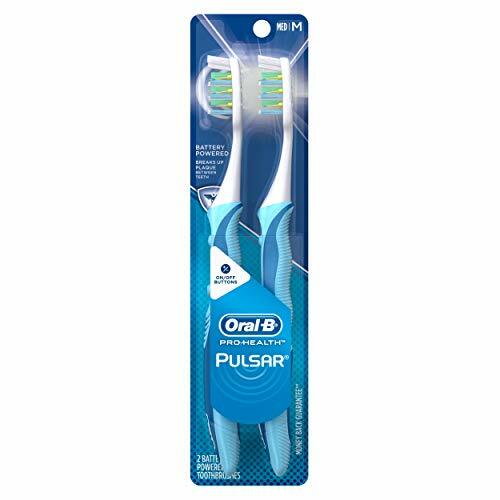 The Pro-Health Pulsar does not have the small round brush head of Oral-B electric toothbrushes, but rather the larger head, like their manual brushes. This brush head is fine and you certainly do benefit from the vibrations and bristle movement that can be controlled by the 2 buttons on the handle. 1 button to turn on, the other to turn off. 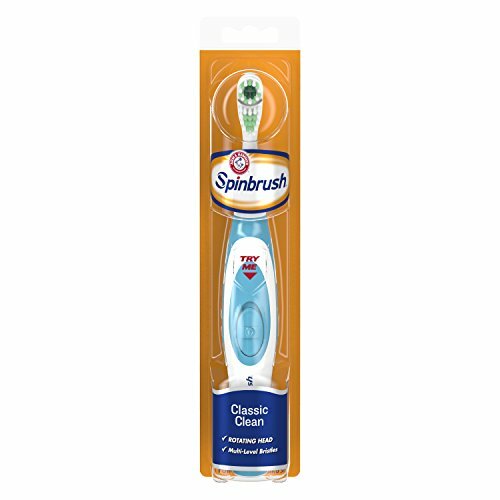 You can feel the brush working and my teeth certainly felt clean after use, but it is not the best brushing experience I have had. You still brush like you would with a manual brush. Slim, light and really grippy, a fair bit of vibration is lost and felt in the brush handle. It is powered by a single AAA battery, but it is not user replaceable. The base of the handle unscrews to reveal the battery, but the design is such trying to remove the battery breaks it. The idea is that the battery is removable for disposal, but not designed to be replaced. It seems silly to be like this and a bit wasteful, but given the bush head is not replaceable either then it is no surprise. Some complain about the battery lasting 6 weeks or less. Mine lasted as long as the brush head (3 months) but it would be disappointing if it didn’t seeing as the battery isn’t replaceable. The brush is not expensive, but a touch more than most manual brushes as a result. There is no timer or pacer or travel case. Overall, this brush is ok and it will provide a benefit, but I believe there are better value options. Design – Slim, light and grippy. Cleaning experience – Far from the most powerful, but you can feel it working. Brush heads – Not replaceable and are not small round brush head like an electric toothbrush from Oral-B. Battery – Not replaceable & questionable life. Although functional, the Spinbrush – from well known brand Arm & Hammer – is perhaps not the best representation of the quality you would usually associate with the brand. The chunky brush handle feels like it will stand the test of time. The brush heads are replaceable so you need not replace the whole brush each time and there are varying styles of brush head available. The brush heads tend to be slightly larger than other brands available, but they do feel like they are working, sweeping away the plaque and food debris. A slightly confusing range of Spinbrush models exist and there is a lack of key features like a 2 minute timer and pacer. You need to time how long you have been brushing for. Although the toothbrush is chunky, a few strategically placed rubber grips would also be nice, as would some form of travel case/cap if taking this brush in a bag with you. For what is a relatively cheap brush to buy in the first place, the brush heads are on the higher side of what you and I would expect. Design – Robust design. Chunky to grip onto. Design – Slightly chunkier design, with limited gripping points. Brush head – Larger than most. Battery cover – Muck builds up around the seal. Cost – Brush heads are a touch pricey. 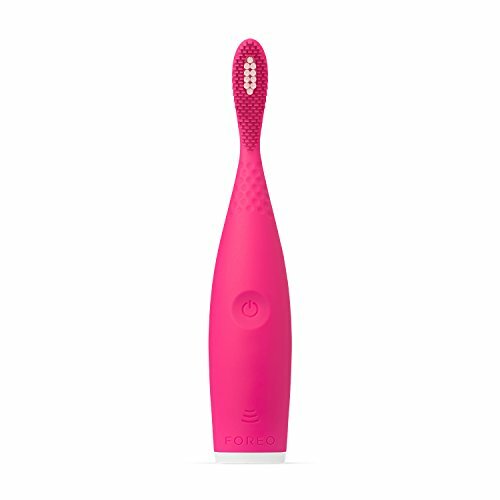 A very eye catching toothbrush, the ISSA Play is available in a range of colors and has a smooth curved shaped and design that we don’t really see on products like this. It is not a cheap brush though and is the most expensive of all the brushes included in this article. There is a premium to be paid for what makes it different. No denying it feels quality in hand, sadly this quality does not necessarily last. Issues of reliability with Foreo toothbrushes has been highlighted and less than ideal customer service has not helped. The AAA battery lasts for a really long time, which is good, meaning less additional cost for replacement batteries and hassle. Offering 9,000 sonic vibrations per minute it can clean fairly well, but it has a silicone bristle head. The brush head may be much larger than what you are used to, and it is also softer and more gentle on the teeth and gums, but it will be more difficult for some to actually get used to using. The use of silicone means the brush heads need replacing less frequently, every 6-12 months. Perhaps a bit of a kicker though is that although less frequent replacement is required the cost is higher per head. Softer brushing and better for the teeth and gums this toothbrush may well be, but a lack of timer or pacer is not going to help ensure you brush for the right amount of time. I expected more for this price. Design – Looks and feels really good. Unique design and eye catching, in a range of colors. Silicone – Use of hygienic silicone means brush heads need replacing less often. Battery life – Long battery life. Brush head – Brush head size, shape and silicone will not be for everyone. Cost – Expensive in comparison to other options. Reliability – Concerns over how reliable the brush is. This part of the article should hopefully answer any questions or queries you may have around battery operated toothbrush and help you understand what makes some better than others and ultimately help you to choose the best battery powered toothbrush. Should you feel that anything is missing and you need a question answered, please reach out by contacting us or commenting below. Why you should listen to us? Nobody writing for the site is a medical professional or is any way affiliated with the brands featured, we are regular people like you. However, what makes us slightly different is that we have spent thousands of hours (yes thousands) researching, testing and reviewing lots of dental health products. We go hands on, actually using them in our everyday lives, listen and see what others have to say, to bring you real accurate and detailed insights into the products on offer today. What is a battery powered toothbrush? A battery powered toothbrush is a brush that benefits from added cleaning power and features. Small electrical circuits and motors within the toothbrush handle send vibrations or pulsations to the bristles on the brush head, using a battery as the power source. With each pass of the brush head over the teeth, the battery power is adding more movement to any manual motion you use. Overall this extra power will help to clean the teeth more effectively removing plaque and food debris. Electric toothbrushes do technically have a battery built in and it is therefore common for battery and electric toothbrushes to be grouped together. However, they are slightly different in that a battery powered toothbrush is a brush with removable and user replaceable battery, which is not the case for most electric toothbrushes. These batteries are usually AA or AAA. A common question and query amongst those considering something more than a manual toothbrush is should I opt for a battery or electric toothbrush. There are pros and cons to each, but typically electric toothbrushes with a built in battery are really the gold standard as they offer a better cleaning mechanism. 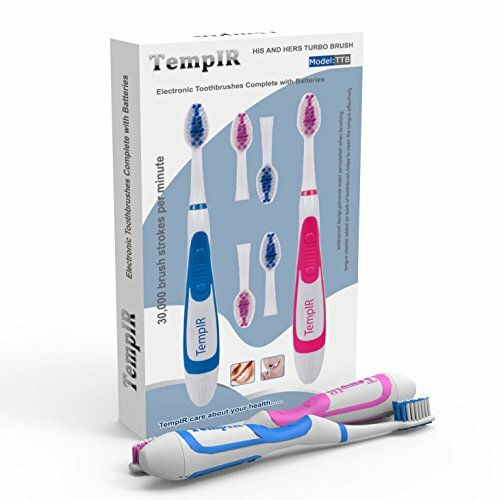 Standard electric toothbrushes clean better by having more rotations, movements or pulsations than either a manual or a battery operated toothbrush can offer. Electric toothbrushes often have more features that can be of benefit to a user such as a pressure sensor. As you will find out shortly, battery brushes are cheaper, than there rechargeable electric toothbrushes, but the cost is not necessarily much less in some cases. You can see my recommendations for the best electric toothbrushes available today here. However, there is certainly a place for a battery operated brush. Somewhat of a crossover between a manual and electric brush, a battery operated brush offers enhanced cleaning capability compared to a manual toothbrush. In addition to this, a battery operated toothbrush offers better convenience when it comes to actually powering the brush. There is no need for a charging stand, just pop in the removable batteries, which themselves can usually be bought from many shops around the world. Pick up batteries from the local garage, corner shop, supermarket, DIY store and many more places. Lasting many weeks if not months, they surpass most electric brushes. Travellers and those always on the go tend to love them. They are too not bogged down with unnecessary features such as cleaning modes that you won’t ever use. This often means they are more streamlined than an electric toothbrush. Oh yes, they tend to be slim and lightweight too. Cleaning power – They clean more effectively than a manual toothbrush because of the increased number of bristle movements. Convenience – Tend to be fairly compact and can be popped in a bag, great for travellers. Removable batteries – Batteries can be replaced with ease. Does not rely on a charger being plugged in. Battery life – Battery power tends to last many weeks or months. Interchangeable heads – Replace the brush head, not the whole toothbrush. Cleaning power – Not as capable or effective as a typical electric toothbrush. Features – Tend to lack desirable features such as timers and pacers found on electric toothbrushes. Interchangeable heads – Some do not have interchangeable heads making them quite expensive and wasteful options. Price – Not always as cost effective as you might think when factoring in the cost of replacement batteries. Warranty – Warranties tend to be just 12 months rather than the 2 years of electric toothbrushes. Reliability – Tend not to be as reliable as more premium alternatives. This is what ultimately helps clean the teeth more effectively than a regular manual toothbrush. When using the right brushing motion with a manual toothbrush, the bristles are going to pass over the teeth up to a couple of hundred times a minute. The electrical circuit and power source on board a battery operated brush allows for the bristles to move or vibrate faster and consistently, meaning up to thousands of movements per minute. Typically a battery powered toothbrush will offer anything from about 2,000 through to about 15,000 movements per minute. Some do offer up to 30,000. Although not always the case, the more you pay the more movements you tend to get. The most advanced electric toothbrushes offer somewhere between 30-60,000 movements per minute, so still quite a significant power increase. Increased movement means greater number of attempts to dislodge, break up and sweep away plaque (and the bad bacteria it contains) and genuinely help improve your oral health. The cleaning sensation experienced when using such brushes does vary. Some feel quite powerful, whilst others feel much more subtle and gentle. Some are quieter whilst others are louder. Some are very efficient, whilst others are less so, losing power to vibration in the handle and not just the brush head. One of the greatest differences between the battery operated brushes is the battery life. Some last for a number of weeks between replacement of the battery, whilst others last months. Most typical electric toothbrushes last just a couple of weeks between charges. The more powerful the brush, the more power it tends to need and the quicker the battery power depletes as a general rule. Some brushes use just 1 x AAA battery whilst others use 2 x AA batteries. Not only does this affect the size, but the more batteries, the longer it is likely to last. Manufacturers of the brushes will give estimated usage time for a standard battery, but the quality of the battery and your brushing style can all have an effect. If you use a very cheap, low grade battery and you have a tendency to scrub your teeth harder than you should, the brush will work harder and is unlikely last as long as it could. If however you let the bristles skim the surface of the teeth (as you should) and you used a premium brand of battery then you will get more usage time. Of course being removable, the batteries can be replaced without the need for dedicated charging stands, power adapters and plugs that might be necessary should you have bought a standard electric toothbrush. AA and AAA batteries are sold all over the world and are generally easy to pick up, no matter your location. One of the benefits of electric toothbrushes are that every 3 months or so you can replace just the brush head rather than the whole toothbrush as is the case with a manual brush. Dentists recommend replacing brush heads every 3 months due to bristle wear and hygiene. Depending on the battery operated brush you select will depend on whether or not the brush heads are replaceable. Compared to a manual brush which tends to be all plastic, a battery toothbrush contains metals and electrical circuits which are even less environmentally friendly. If the brush does not have replacement heads, every 3 months you are disposing of what might be a perfectly functional brush handle and then having to replace it again. But there are those that do have replacement heads, with handles that can be reused and are less damaging for the environment, as just the head is being disposed of rather than the whole brush. Personally I think this is something you should consider as part of your purchasing decision as it is beneficial to help the environment and you will find (as demonstrated later) it is actually cheaper to buy a brush with replacement heads than it is to throw away and replace the whole brush each time. It is not 100% critical to your buying decision, but all too often the nation as a whole does not brush for as long as they should. 2 minutes is the dentist recommended cleaning time, but with so many brushing for less, it is the addition of a timer and pacer that aid and encourages longer brushing cycles. A manual brush does not have such a timer, whereas almost all electric toothbrushes do. Battery toothbrushes are somewhere in the middle, some have this built in and others do not. The best battery operated brushes do and I believe will further help you achieve better oral health as you know how long to brush for, because the brush is essentially telling you. Battery operated toothbrushes tend to be a bit more expensive than a basic manual toothbrush. Perhaps not that unsurprising given that they come supplied with a battery and the brush itself is a bit more complicated to make. Whilst traditional electric toothbrushes will normally cost even more than a battery operated toothbrush, it can be surprising at what the price differences actually are over several years. Prices are always subject to change, but here is a breakdown of some costs over a 3 year period to give you an idea how they compare. As the figures demonstrate, whilst it is more expensive to go battery/electric over a manual brush, the actual cost difference over 3 years to go to a more advanced toothbrush like the Oral-B Pro 1000 is not that much greater. Battery operated brushes need little in the way of actual maintenance. As the battery depletes, this will of course need replacing. How frequently this is will depend on the brush you are using. The brushes should be rinsed or wiped clean and can be towel dried to keep them in good order. Rinsing off the brush helps get rid of bacteria and toothpaste buildup. Make sure the seal around the battery compartment is clean and excess moisture does not build up here as this is a place for bacteria to breed and degrading of the seal to take place. Varying from one manufacturer to another, typically battery operated brushes will have a warranty period of 12 months. Whilst it is a very sweeping generalisation, the product quality and reliability tends to be inferior to the more expensive electric toothbrushes. Most electric toothbrushes will come with a 2 year warranty. It is not always cost effective to get the brush repaired or replaced under warranty, especially if you have to post it off, but longer warranty periods can give an extra degree of satisfaction to ownership and peace of mind should something go wrong. You can buy battery operated brushes from many places. Most pharmacies and grocery stores will stock some and Amazon offer a good range too. Prices do vary from one place to another, but there tends not to be significant price difference between these outlets, unless particular promotions are being run. If you are particular about the brush you want, it may well be available only from select locations, so this may require more effort or shopping around on your part. The best advice I can give, is the more you are spending, take just a few extra minutes to shop around and make sure you are getting the best deal and you are ultimately comfortable with the purchasing decision you are making. Have you got something you would like to add? Is there a question that has not been answered? Got some feedback or suggestions of other battery operated brushes? Please leave a comment below so that everyone can benefit. Jon, this is exactly the comparison piece I needed. It’s too bad this is fairly recent overview because I was hoping something new would have popped up during my own research, which merely confirmed what you posted. I only saw this after a lot of time spent online. I just wanted a good AA battery toothbrush with a timer. The rechargeable are affordable enough but they stop charging altogether sooner than I prefer. I am sighing across the pond. I am glad you found it useful, even if you did not find it quite when you needed it. We have only recently begun creating content for the USA, having previously focused on the UK. Now you know where we are, should you have any dental health queries in the future, you know where to come.